I am loving spring with all the beautiful scents and colors. I love seeing the trees budding and all the beautiful spring flowers popping out everywhere. All the beautiful spring flowers have me playing with Quikwood again (see Flower Canvas). I thought it would be fun to create these flower hearts. They are a sweet little gift for mom and/or anyone special in your life. They would also be fun to hang on someone’s door as a little surprise. 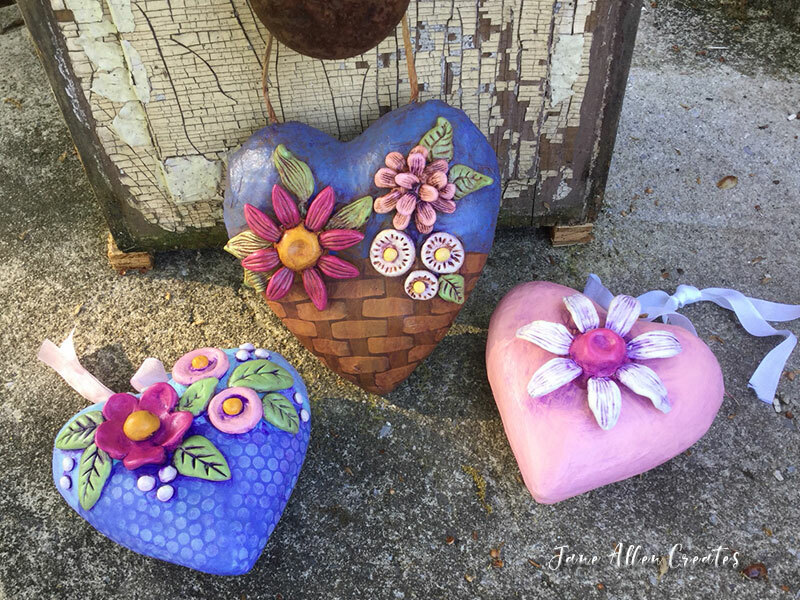 To make these I started with paper mache hearts. The smaller ones are about 4″h x 4.5″w, they are made by Paper Studio and I got them at Hobby Lobby. The larger heart is about 5″ x 5″, it is made by Darice. If you have not worked with Quikwood before check out the basics video on this post – Egg Peeps The video is at the beginning of the post. I like to paint as I create with Quikwood. It makes it easier than painting everything at the end. You can paint the hearts your color of choice. I painted the top of the larger heart Harbor Blue and the bottom Espresso. The one smaller heart is Cotton Candy and the other heart is Harbor Blue and Whispering Turquoise. On the larger heart I wanted the bottom to look like a basket so I painted vertical lines with Raw Sienna using a #3 round brush. I then went over the vertical lines with a #4 shader and Honey Brown. I start at the bottom at the outside vertical line, going over the center vertical line and ending at the other outside line. I continue in the same manner as I went up the heart alternating the lines I went over. On the smaller blue heart I stenciled the bottom of the heart with Punchinella (sequin waste) using Whispering Turquoise. I started working on the two-tone heart. As I worked on these projects, I would start by cutting a 1/4″ slice of Quikwood and mixing it and sculpting with it. I would repeat this as I needed more Quikwood. For the large flower I shaped the Quikwood into a slightly flattened ball. I then use a tool and made five cuts into outside edge and then placed it in desired location and pressed in center with my finger. Then pull and lift petals and shape. For the smaller flowers, make a ball and press into place indenting center with finger. Make desired size ball for center of flowers. For leaves roll a cone shape and press into place. Using a sculpting tool for veins. Roll small balls for smallest flowers and press into place. For the other two hearts I used a flower mold to make some of the petals and the leaves. The mold I used I got at Hobby Lobby. It was with the sculpting supplies. I made the petals using the mold. To get the petals easily out of the mold spray it lightly with cooking oil. Roll a piece of clay and press into mold. As the petals were drying I would bend them slightly. I then used a ball of clay for the center and pressed the petals into place. I then sculpted the leaves and pressed them into place on the heart. On the larger heart the three smaller flowers were made the same way as on the two-tone heart. I just put the little lines around the edges with a pointy sculpting tool. On the smaller hearts I also created an eye hook at the top out of Quikwood. Paint desired colors. I used Cotton Candy, Foliage Green, Mustard Seed, Royal Fuchsia, Sunny Yellow, and Warm White. Allow paint to cure and spray varnish before antiquing. I like using DecoArt’s Antiquing Medium so that I can antique my projects any color I want. I use Dioxazine Purple on my two smaller hearts and Raw Sienna on my larger heart. Mix your paint with the medium 1:1. After antiquing I wished I had also used the Dioxazine Purple on my larger heart so I went over it with the purple. When they dried I spray varnished them. I hope you enjoy this project and may you have a very blessed Mother’s Day. PS. I used DecoArt Products for these projects. Beautiful work! Thank you for the project instructions. What a great idea, you are so creative. Thank you Jane for sharing.